Here are valuable resources posted by me and my colleagues in Media Enhanced Learning course for web 2.0 tools. IbuildApp: enable you to create an app from your site either for a small fee or a revenue share. Bubblus : Used for brainstorming made simple , visual data, flow charts. Mindmeister : Used for mindmaps and schematic diagrams. Bensounds: Where you are able to use music for free. Free Digital Photos : allow you to use images for free and you have an option to pay to upgrade to larger images. Pixabay : promote free high quality images. Teacher Tube : It more educationally focused when compared to others, it allows teachers and students to set up accounts for free and upload videos, lesson plans, and curriculum content to be easily-accessed both in schools, institutes and at home. It is provide safer learning environment for educators and learners. There are no lengthy advertisements prior to videos and users can create collections of videos to share with others with only one hyperlink being needed. DropBox : provide 2 GB storage and, you can share files online. Flisti : Super easy polling system. No signup required. MicroPoll : Good for creating a poll to embed in a blog or some other website. Polldaddy : Free and paid plans available. Poll Everywhere : Unlimited polls with up to 30 respondents on the free plan. Vorbeo : Another system for creating a poll to embed in your website. Cram : is a good study tool to create, print, share and download millions of flashcards. ProProfs Quiz maker: ideal for creating quizzes, tests and exams. Delicious : The first and still one of the most popular social bookmarking tools. Its interface is very easy to use. Wordle : one of the first and free tag cloud creators, it allows users to create customizable word clouds from any text, and it gives greater prominence to words that appear more frequently in the source text. Tagul : Another cloud creator, it is free for noncommercial use only, that uses flash platform instead of java applets used by Wordle that some browsers don’t run, you can embed your Tagul clouds into your blog or website check this link for more details to do that . 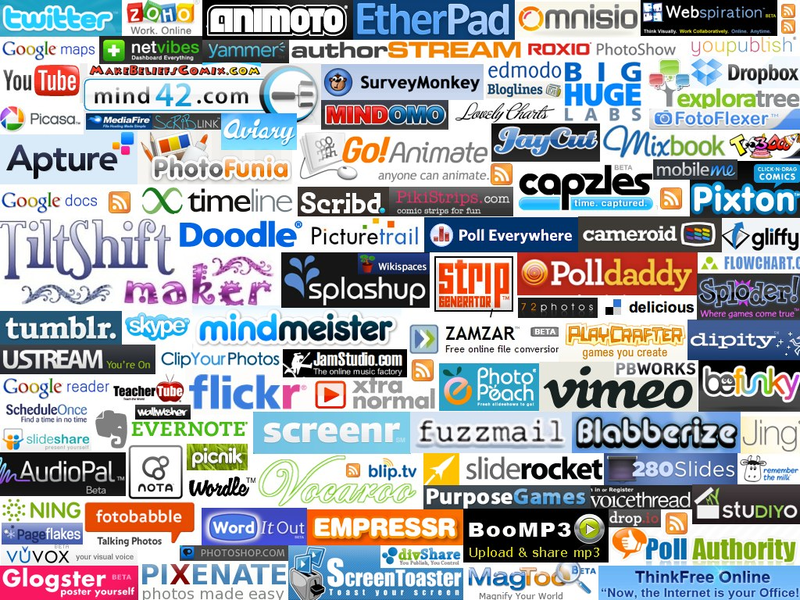 Tagxedo: is a free cloud creator that creates visually stunning, customizable word clouds. Similar to Wordle, however, it allows for greater customization of the final cloud particularly in its shape and the file format output. Forvo : pronunciation dictionary comes,users can hear any word pronounced in any language. I wish you to : is a free tool to draw and animate a greeting card. Padlet :is free online tool where anyone can build a wall and everybody can stick post-it notes electronically onto the wall. Cueprompter : is a free online webtool that allows you to copy and paste, or type in text onto a screen that then can roll along like a teleprompter while you are recording a webcast. Evaer: Captures original Skype audio and video data to record with high quality.